Take an object, any object –> for three minutes look at it, handle it, examine it, close your eyes and visualize it while still holding it, open your eyes and compare the picture in your mind to the actual object, measure it, if you want, correct the visualization in your mind about this object. At the end of 3-5 minutes doing this, remove the object to another room – physically take it and place it there where it is obvious but out of view. Come back, sit down with lined paper, unlined paper and pencil. For five minutes, draw the object and write a thorough description of the object from the mental picture of it as clearly as possible. 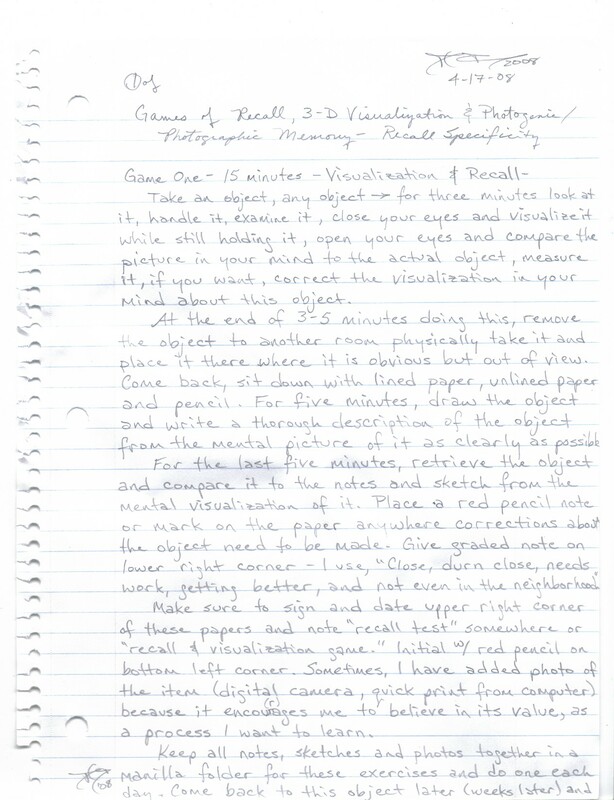 Make sure to sign and date upper right corner of these papers and note “recall test” somewhere or “recall & visualization game.” Initial with red pencil on bottom left corner. Sometimes, I have added photo of the item (digital camera, quick print from computer) because it encourages me to believe in its value, as a process I want to learn. Keep all notes, sketches and photos together in a manilla or colored folder for these exercises and do one each day. Come back to this object later (weeks later) and try recall of mental picture first without review to make notes & sketch. Then, examine object for corrections, review and do exercise / recall game process on it again. Try to recall pictures of the actual object in the mind’s visualization at a time, not involved with this game to see how clearly its presentation has become. Either it is or it isn’t. Each object done will make all of them visualize clearer in the mind. Take a book –> any book, phone books work great, especially yellow pages but any book will do – ones that have been read or those that have not. Open to any page. Look at page for a few seconds up to one minute. The faster, the better for this game. Close your eyes, ask yourself to see page from the book just seen. Ask to see cover of book and page you’ve just examined. Look for page number in your mind’s mental picture of it. On the second pass, correct the comparison of the actual elements from the page with the notes and any sketches you’ve made using a red pencil. 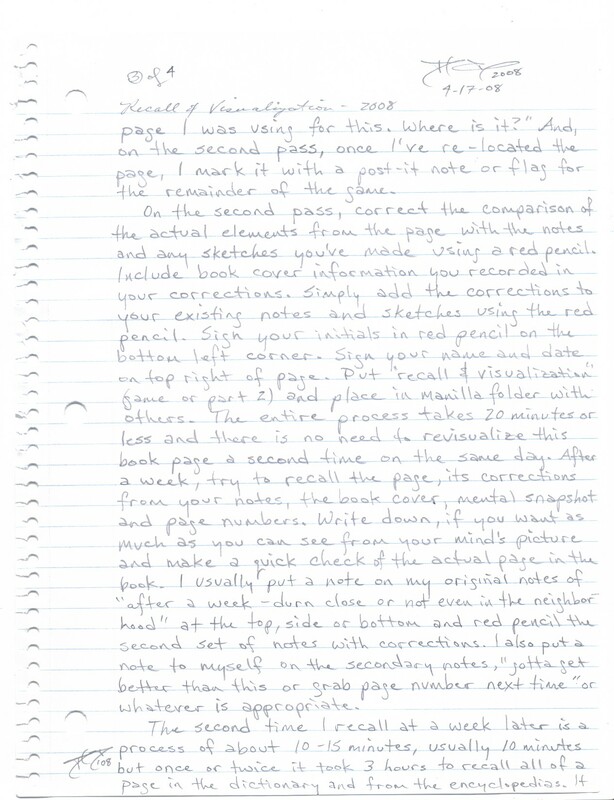 Include book cover information you recorded in your corrections. Simply add the corrections to your existing notes and sketches using the red pencil. Sign your initials in red pencil on the bottom left corner. Sign your name and date on top right of page. Put “recall & visualization” (game or part 2), and place in manilla folder with others. The entire process takes 20 minutes or less and there is no need to revisualize this book page a second time on the same day. It has been my experience that the process gets worse – not better – when done on the same day for whatever reason and your results may differ. After a week, try to recall the page, its corrections from your notes, the book cover, mental snapshot and page numbers. Write down, if you want, as much as you can see from your mind’s picture and make a quick check of the actual page in the book. I usually put a note on my original notes of “after a week – durn close or not even in the neighborhood” at the top, side or bottom and red pencil the second set of notes with corrections. I also put a note to myself on the secondary notes, “gotta get better than this or grab page number next time or what color is that book,” or whatever is appropriate. The second time I recall, at a week later, is a process of about 10 – 15 minutes, usually closer to 10 minutes but once or twice (or honestly, more than that because I could), it took 3 hours to recall all of a page in the dictionary and from the encyclopedias. 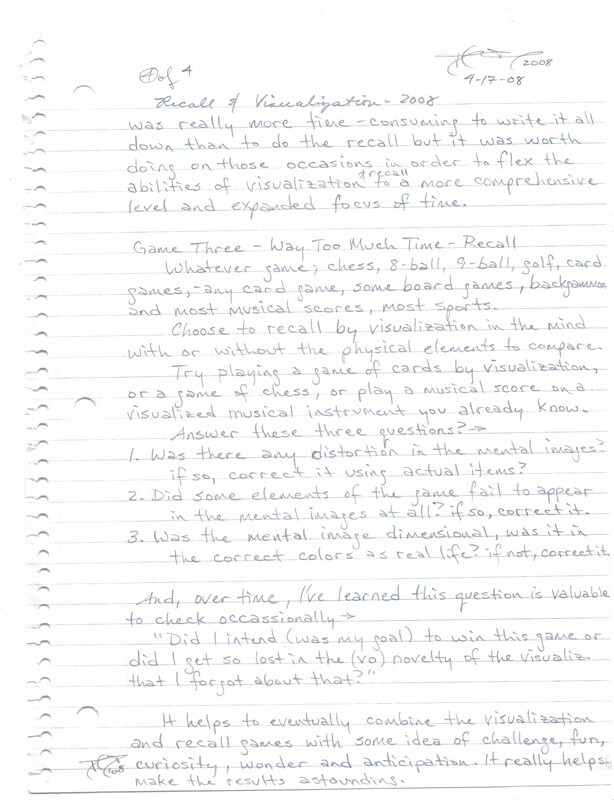 It was really more time consuming to write it all down than to do the recall but it was worth doing on those occasions in order to flex the abilities of visualization & recall to a more comprehensive level and expanded focus of time. These are both very valuable and worth improving always. Whatever game: chess, billiards, 8-ball, 9-ball, golf, card games – any card game, some board games, backgammon, and most musical scores, most sports. Choose to recall by visualization in the mind with or without the physical elements to compare. Try playing a game of cards by visualization, or a game of chess, or play a musical score on a visualized musical instrument you already know. 1. Was there any distortion in the mental images? if so, correct it using actual items. 2. Did some elements of the game fail to appear in the mental images at all? 3. Was the mental image dimensional, was it in the correct colors as real life? It helps to eventually combine the visualization and recall games with some idea of challenge, fun, curiosity, wonder and anticipation. It really helps make the results astounding. Back when I was around 11 and 12 years old, I was studying a book called, “Atlas Shrugged” by Ayn Rand. As part of a class at LA Baptist High School when I started 7th grade, I was required to read two books about the same time that I was still studying this, called “The Greek Way” and “The Roman Way” by Edith Hamilton. They were talking about the demise and the contributing factors in that demise of those two societies historically as “Atlas Shrugged” described much of what could happen if those who could didn’t or weren’t allowed to contribute when it mattered. Just for the record, I had already been working on applying the principles of two other books I had been studying for awhile. One was “Psychocybernetics” by Maxwell Maltz and the other was by Norman Vincent Peale about positive thinking, “The Power of Positive Thinking,” along with other positive thinking and can-do thinking books by Dr. Robert Shuller of Garden Grove Church. As much as all of my family is and was from the South ( in the United States) and in spite of my starting elementary grade school in Georgia, we were in California off and on through my elementary school years, then stayed in California from about my sixth grade year through high school. At 7th grade, I started attending a college prep school (at that time) called LA Baptist High School in Sepulveda, California in the San Fernando Valley. It was before this and during this time, that I was studying “Psychocybernetics” and “Atlas Shrugged” on my own to apply them to my daily living and was introduced to these other books. To say they influenced me would be misleading. Unfortunately, I had already traveled with my family across this country a couple or three times and had noticed huge and alarming disparities in a number of key areas but I didn’t understand why they were so. I was inclined to look for disparities because in my years of trying to learn and understand Daddy’s college books on thermodynamics and in many talks with him, I knew – “disparity in a system = volatility and weakness in the system or indicates unknown variables & factors unaccounted for otherwise (in equations & theories).” – quote mine. Then, I had an idea that if I and others like me simply changed as part of our society’s members, then the unfolding as it happened in the Great Societies that have fallen before ours ever existed, could be altered. It would be (by nature) altered by the fact that some would exist in it that could affect change as needed in small ripples of difference here and there. So, I set about to change me from inside out and by sharing what I learned with others around me as I moved forward in my life. To do this, I used the “Psychocybernetics” materials to do several things and the “Power of Positive Thinking” to do some things for the creation of new habits of thought. These were added to what I already had inside which was a lot of despair and futility about a whole lots of things that I already had realized. Yet, still I wanted what I had asked God to give me when I was five years old and every prayer thereafter – “for me to have – Wisdom”. I thought it was really, really valuable and important. Now, I wish never to have asked for that but during all of my years growing up I believed that “challenges” and to “thrive and succeed through challenges” were something magic and powerful which would make me a much better person and more capable to do more things in my life. So, I set the work of the “Psychocybernetics” book into action by self-hypnosis and by establishing goal-driven positive thinking habits and games of recall. Internally, I used the “Island In the Sky” from the book, “Psychocybernetics,” and “The Power of Positive Thinking” to create a place for safety and meditation as well as a place to do work learning, inventing, playing music, resting, writing, creating – inside my mind and psyche. I worked over each element of it with intention and purpose, using self-hypnosis to establish it and to strengthen its mental imagery. Then, I purposefully created a core and other spaces – gardens, waterfalls, gentle streams, ocean and places with its scenes to walk there, forests, meadows and a mountain where I could interact with God, although He is everywhere in my eternal worlds inside that I created. There are also places I like that are there including a rock house near a small stream where I can rest and heal, a place in the forest with beautiful soft mosses to lie on next to a sparkling creek and several other places to swim, ride horses, rest, sleep, fly, play, walk on the beach – all in my mind’s special island. After about two months of doing this before going to sleep each night, I was in meditation one afternoon before practicing the piano, (I think it was a Saturday afternoon alone at my family’s apartment) when I discovered a new place in my internal world. I had not put this place there but it was there and I explored it with amazement. I was twelve years old at the time and had been working with the “Psychocybernetics” book for awhile at that point. There was this great central core inside my mind and subconscious that I could easily see in its entirety with many floors and rooms holding everything – all things I knew or had worked on or created or learned. I was able to go on any floor, in any room and find things there in progress as I had worked on them at three years old, or five or eight or ten or whenever and it was all there waiting as new parts and elements were being added. Some things I started at six years old had the necessary elements to do a little more work and complete them now at twelve and thirteen years old. And, some of my most recent learnings set on shelves and in other rooms of their own in progress with groups of new information standing in stacks nearby. Over the years, I had used this process each day never really understanding that it was in any way unusual. It works for me and as things happened in my life, I restored these things at each point that it was necessary to relearn them or re-establish them. As much as I haven’t been tremendous at anything in my lifetime, it may seem unnecessary to psychologists and psychiatrists. Yet, I beg for mercy and freedom to be allowed to be such that I am and no longer be forced to be like any one else. This way works for me. It is not very impressive to see what is considered normal, especially considering it is now the twenty-first century with a very educated population. But, for some reason – there exists less basic literacy among educated individuals than I would’ve ever expected. My guess is the degree of input far outstrips the skill sets that many have been given. All I know to do now – is to share what I do in the way I know to do it that maybe this will be of some help. It takes work, though, and it rarely seems that people around me are willing to make that effort for themselves. And, after all these years of doing it this way, I can honestly say – it is worth it. There are many things that do not enhance life, that do not encourage quality of life and that do not get better as they go along. These skills are enhancing of life, they do encourage quality of life and definitely get better, make life better and make more possible in every day than anything else I’ve ever seen or experienced. Now, if I can simply acquire the rights and freedom to be as I am and do what I know how to do – my life will be much better and more comfortable.